In 1951, Dylan Thomas, one of the finest Welsh poets ever to cross the River Severn sat in the corner of Henekey’s Long Bar in Holborn, writing. The acrid smell of cigarettes, pipes and cigars mixed with the sweet aroma of stouts, ales and beer, would have made for a heady mixture. Perfect conditions for this people’s poet to pen a little song, glass in hand, seated at one of London’s most famous bars. Henekey’s is now known as Cittie of Yorke, having been renamed by its new owners, the Samuel Smith Brewery, in 1979. It has been claimed that a pub or alehouse has traded on this site since around 1430. If that were true, and the original building still standing, it would make the Cittie of Yorke the oldest pub in London by some considerable margin. But like so many landmark pubs, its site has had different occupants over the centuries. In the 17th century the building was host to one of the coffee houses that were then so fashionable. However, the pull of the grape and grain seemed irresistible and owners of these coffee houses soon felt the need to introduce something a bit stronger for their clientele. The coffee took a back seat and alcohol resumed its supremacy. In the early 1920s it was deemed time for a structural makeover of the pub and the present building was conceived and erected. The classic late Victorian refurbishment of so many London pubs with fine etched glass, lots of mirrors and the seemingly exclusive use of mahogany as an interior finishing timber, was dismissed by the chosen architects. Instead, a return to Tudor values was decided upon. Seated in the Long Bar in the early afternoon when the legal eagles have left to undertake their due diligence, or whatever it is they do, and calm has descended, I have tried to understand what the architects wanted to create here, and why, because this is a very special pub. The horrors of the First World War had brutalised the nation, and I suspect that the architects were seeking a design that could take the public out of themselves and back to happier days of yore. 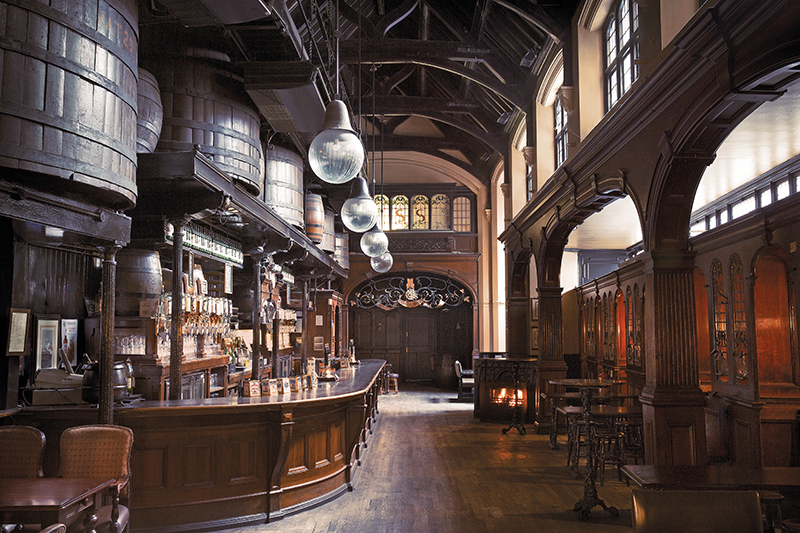 What they created is arguably one of the most impressive interiors of any pub in London. It has the feel of a medieval baronial hall, or perhaps a hunting lodge, though that might just be the effects of the Sam Smith’s beer. Small but beautifully formed best describes the Dog and Duck. Also beautifully formed but not so small is Cougar, the Bullmastiff pub dog, who sits imperiously in the window by the Bateman Street entrance on most days, overseeing the comings and goings in the street outside. Customers hail him as if he was the pub landlord, which I suppose in many ways he is. Certainly you would not want to argue with him. Following the Great Fire in 1666, many of London’s wealthy inhabitants sought new places to live, well away from the cheek-by-jowl houses in the City that had succumbed so quickly to the flames. Soho Fields seemed ideal, and a number of ‘A-list celebs’ of the day acquired land here and built fine homes. But, for some reason, by 1688 the area had started to attract immigrants, mainly French Huguenots, and for a number of social and economic reasons this cultural mix failed to gel and the wealthy moved away. By the early 18th century, a lot of the nice houses had fallen into ruin and were levelled – the Dog and Duck pub was built on part of the site of Monmouth House, the London home of James Scott, 1st Duke of Monmouth. The pub has many literary and artistic associations. George Orwell was a fixture at the bar and there is a rather pretty dining room upstairs named in his honour. It is claimed that in its time the pub has also welcomed the English painters John Constable and Dante Gabriel Rossetti, Karl Marx, and Dylan Thomas – all good drinkers and no strangers to the local bars of Soho. Two other notable historical figures may have frequented the Dog and Duck – none other than Casanova and the painter Canaletto both lived just around the corner for a while, though not together and at different times, so it is quite possible that they could both have been regular visitors to the pub for a quiet pint and a game of quoits on Monday nights – why not? The Blackfriar was built on the site of London’s Dominican friary in the parish of Ludgate. The Dominicans were known as ‘the blackfriars’ because of the black cloaks they used to wear. King Edward I gave permission for the friary to be built in 1276, and would have spent some time within its walls, as it was used for state occasions including meetings of Parliament and the Privy Council. In 1539, the time of the Dissolution of the Monasteries during the reign of King Henry VIII, there were but 15 friars left and there is little record of their fate. There is more detail, on the other hand, of the considerable amount of ‘plate’ (gold and silver) recovered, which ended up in King Henry’s coffers. The Blackfriar pub was built in 1875, and remodelled by the architect Herbert Fuller-Clark in about 1905. To many, its rather bizarre exterior resembles the prow of an ocean liner. But originally there were buildings close beside the pub, separated only by narrow passages. They were later demolished to reveal the novel existing structure. That, too, was nearly pulled down in the 1960s, but several powerful literary figures, including Sir John Betjeman, leapt to the Blackfriar’s defence and thankfully it is still here to tell its tale. And what a tale it is. Historians will tell you it is the finest pub interior anywhere in London. The outside of the building is certainly striking, but it does not prepare you for this astonishing interior. When the Blackfriar was remodelled, the interior was designed by the sculptor Henry Poole. Like the pub’s architect, he was influenced by the Arts and Crafts movement. Remembering how close we came to losing the Blackfriar back in the 1960s, it is reassuring to know that this treasure is now a Grade II listed building – a London pub with an interior that absolutely must be seen to be appreciated, or believed. The trade unionist and politician John Burns famously described the River Thames as ‘liquid history’ and many of the establishments on its banks have an important place in that history, this one in particular. Early records describe a pub called the Shippe on this site in 1550. Several fires later, in 1780, another pub occupied the site, the Spread Eagle and Crown. The current name, however, and the reason for this London pub’s fame, comes from its connection with the Pilgrim Fathers, who embarked on the first stage of their long journey to North America from this very spot in 1620. On the night of departure, 102 puritans boarded the Mayflower from the steps alongside the pub at high tide and set off for the New World, where they hoped to be able to practise their religion freely. The significance of this historic embarkation resulted in the pub rightly being renamed the Mayflower in 1957. It is said the ship’s master, Christopher Jones, did not want to pay the dock fees and so boarded his passengers from this free and easy-to-find location. The present owners of the Mayflower have introduced a rather nice way of remembering the ship and its pilgrim passengers. If you are able to prove a family connection to anyone on the original passenger list – and it would seem a lot of people can – you are invited to sign ‘the descendants book’. There is quite a bonanza planned for the 400th anniversary of the sailing in 2020. It is only a small pub, but throughout that year it can expect thousands of new visitors, all keen to see the place where their forebears once stood. 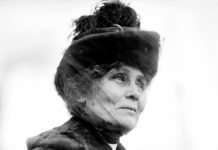 Before they left, many of those emigrants wrote instructions for their next of kin or friends in case they failed to return. Copies of these are framed on the walls of the Mayflower and make a much more enjoyable reading experience than looking at the early maps of Devon and Rutland that are unimaginatively displayed in a surprising number of our classic pubs. 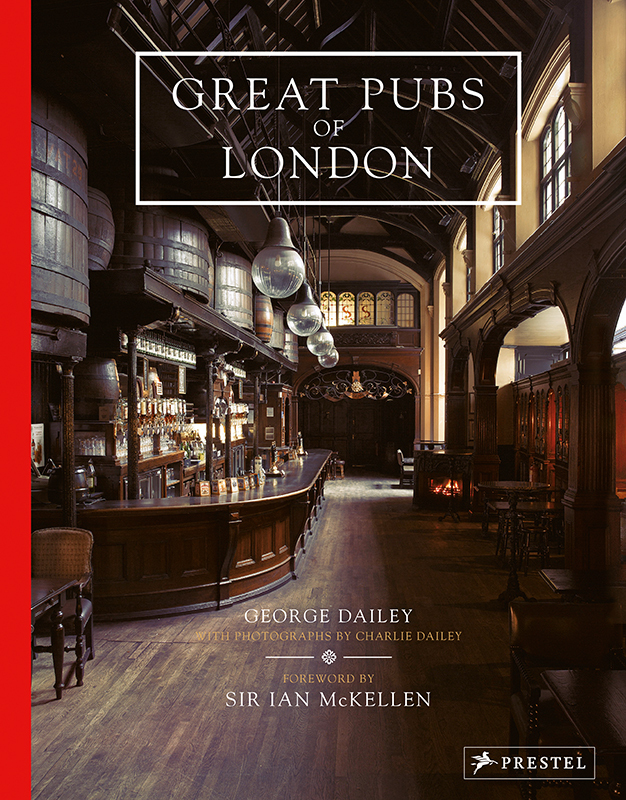 This feature is an edited extract from Great Pubs of London, written by George Dailey with a foreword by Sir Ian McKellen (Prestel, £24.99).